Background: Atherosclerosis is a chronic inflammatory disease which may lead to major cardiovascular events. The primary cause of atherosclerosis is Dyslipidemia. The increased level of lipid profile triggers endothelial dysfunction. This results in inflammation with the recruitment of monocyte, macrophage, T lymphocyte, and Mast cells secreted by an Lp-PLA2 enzyme which causes binding between macrophage and oxidized LDL. This binding results in the formation of foam cells and also the migration of smooth muscle cells. Following that, an Lp-PLA2 receptor hydrolizes OxPC which results in LysoPC and OxNEFA, bioactive compounds which stimulate the progression of atherosclerosis plaques. This process leads to cell hypoxia, which may result in the increase of HIF-1α and VEGF expressions and induction of vasa vasorum angiogenesis. 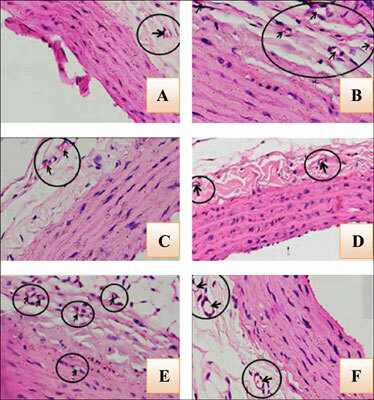 Employing darapladib as an agent of Lp-PLA2 selective inhibitors, this study aimed to find out the effect of darapladib as an Lp- PLA2 selective inhibitor agent on the formation of vasa vasorum angiogenesis and the decrease of HIF-1α and VEGF expression in aortic tissue of rats with dyslipidemia. Method: A true laboratory experiment with a randomized post-test control group design used 30 male spraque dowley rats as animal models which were divided into 6 groups: Normal 8 weeks, Normal 16 weeks, Dyslipidemia (DL) 8 weeks, Dyslipidemia (DL) 16 weeks, Dyslipidemia with darapladib treatment (DLDP) 8 weeks and Dyslipidemia with darapladib treatment (DLDP) 16 weeks. The data measured in this study were the lipid profile (total cholesterol, HDL, and LDL). Using EnzyChrom TM kit, hematoxylin eosin, and double-labelling immunofluorescene, the levels of lipid profile, vasa vasorum, HIF-1α and VEGF were measured. Results: The study results which were analyzed using NOVA test showed that with darapladib administration, there was a significant decrease in vasa vasorum angiogenesis (p=0.000), HIF-1α (p=0.005) and VEGF (p=0.009) expression in each time series. This result proves that Lp-PLA2 inhibitor reduces inflammatory process. Conclusion: Darapladib injection as an Lp-PLA2 selective inhibitor correlates with the decreasing vasa vasorum angiogenesis through alteration in HIF-1α and VEGF expressions in the aorta of high fat diet rats. We recommend further experiments to determine the effectiveness of darapladib with earlier time series in the atherosclerosis process. Atherosclerosis, darapladib, dislipidemia, HIF-1α, vasa vasorum, VEGF.